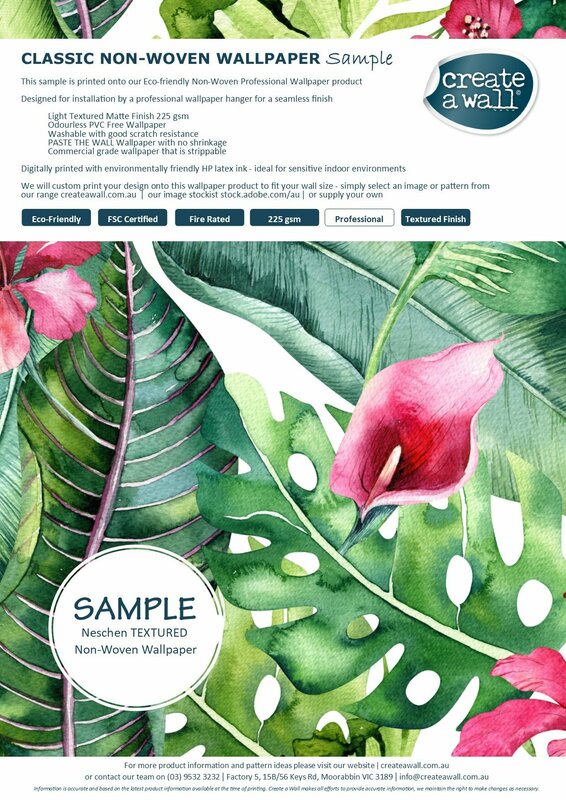 Create a Wall’s range of digitally-printed eco-friendly wallpaper products has been selected with the help of expert local suppliers to ensure they meet the highest Australian Standards. We can now offer bold wall decorations and provide reassurance by using products with environmental certifications that have been responsible sourced. Our NEW range of wallpaper products has been specifically created for a sustainable approach to large-format printing. 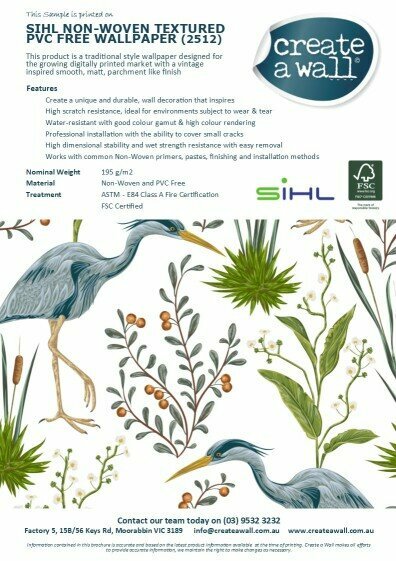 With a shift in focus to print top quality wallpaper products, with on trend designs, for a superior product that is better for the environment. 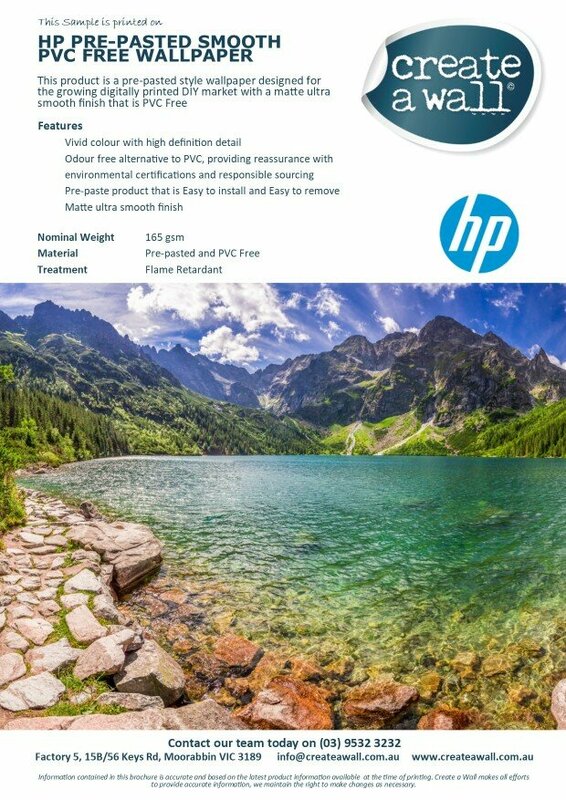 These PVC FREE products have been created and tested by trusted manufacturers, from reputable brands such as Hewlett Packard, Neschen and SHIL. Based on an end-to-end sustainability approach we aim to minimise environmental impact though careful product selection and improved printing methods. Create a Wall has been at the forefront of the digital wallpaper revolution; using only HP Latex Inks, our water-based and odourless products are ideal for sensitive indoor environments like healthcare facilities, childcare, aged care, schools, hospitality, hotels or throughout the family home. Our goal is to work collectively with our clients in creating custom-made wallpaper, allowing designers to give their clients a detailed point of difference on each and every project with an improved environmental approach. 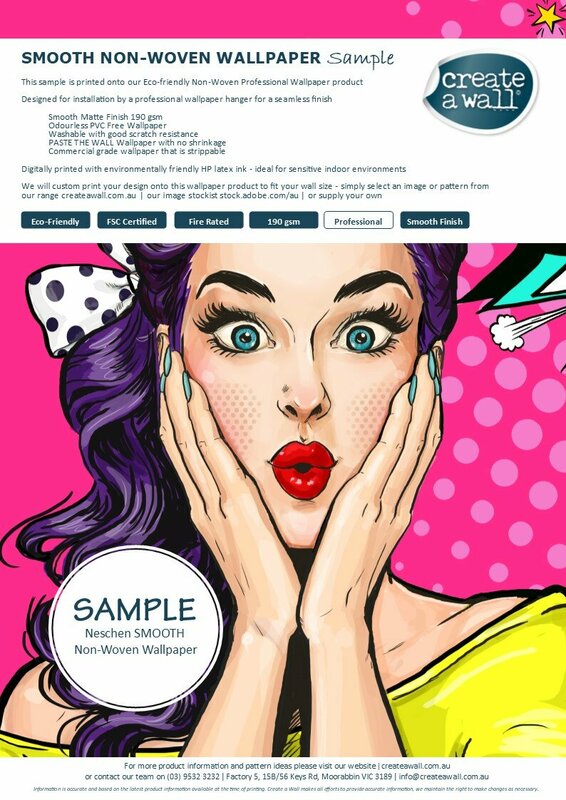 Simply selected your chosen product from our exclusive range and we will print and supply your creation; or, if you require your design to be printed on a particular product or style of wall covering, please let us know so we can assist you in bringing your vision to life. For more information or to obtain a FREE SAMPLE PACK of these specialty products please contact our team at [email protected] or fill out our contact form below. Our eco-friendly Prepasted Wallpaper product has bee specifically designed for the removable DIY wallpaper market. This easy to install removable wallpaper produces quality custom designed prints with minimal waste. If you are one of the many people looking for an environmentally friendly alternative to the popular ‘peel and stick’ vinyl and polyester wall-coverings in the market today, this is the product for you. It is an odour and PVC-free alternative producing high-performance, flame-retardant wallpaper with an ultra-smooth finish provides vivid color and high-definition detail. Our Eco-friendly Non-Woven Professional Wallpaper product has been specifically designed for installation by a professional wallpaper hanger for a seamless finish.